Christmas is on its way to meet every one of us very soon. Have you gotten into the spirit of Christmas? If not, it’s time for you to do something now, for example, set a Christmas ringtone for your iPhone. We all know it is the time that we should prepare everything well before Christmas and wait for its coming. We need to prepare gifts and foods in advance. But, don’t forget, Christmas song is one of the most important and interesting things that remind you of the Christmas season. If you’re in the mood for Christmas, shouldn’t your phone be in the mood too? You can get some great Christmas ringtones for your iPhone to make yourself and everyone around you in the mood of the Christmas season. You can download Christmas ringtones for iPhone, in this way, every time your phone rings, then you will feel the Christmas joyful spirit and atmosphere. 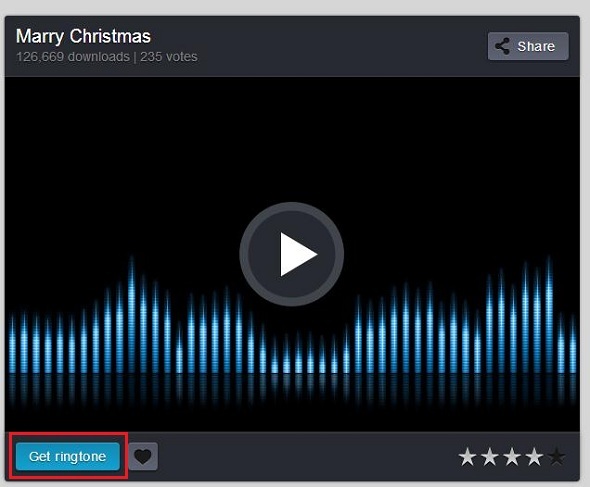 So, what are the most popular Christmas ringtones for iPhone? 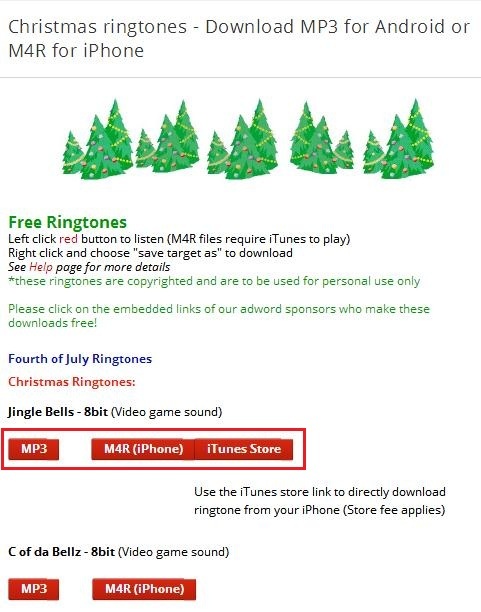 Where can you download free Christmas ringtones for iPhone? 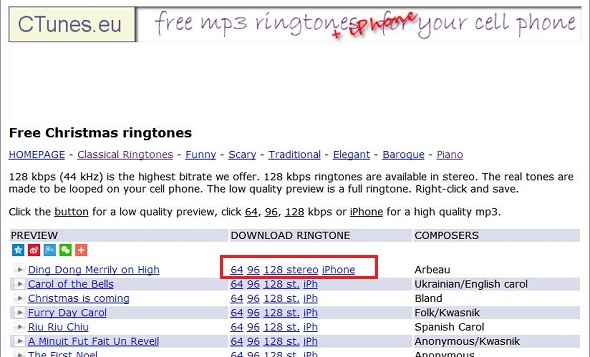 If you still have no idea, don’t worry, after reading this tutorial, you will know how and where to get Christmas ringtones for iPhone. What is your favorite type of Christmas ringtones? Traditional ringtones, love ringtones or popular ringtones? There are many caring and romantic songs for lovers and couples to spend the Christmas with. Traditional Christmas songs are the most symbolic object to human souls. They are the true reflection of Christian religious topics, suitable to be played on different occasions. And, last but not least, the Christmas songs for kids. They are both energetic and warm, and bring happiness to kids in an easy way. Here we will introduce some ringtones for you to download. 1. O Holy Night: “O Holy Night,” composed in 1847, has become a favorite carol for solo vocal performances. Celine Dion applied the huge sound of her voice to the classic song on the 1998 collection These Are Special Times. 2. Carol of the Bells: “Carol of the Bells” is a popular Christmas carol composed by Mykola Leontovych in 1904 with lyrics by Peter J. Wilhousky, known by a four-note obstinate motif, covering the genres of classical, metal, jazz, rock, and pop. 3. Santa Claus Is Coming to Town: This Christmas song ringtone was first performed on Eddie Cantor’s radio show in November 1934. Then, it became a hit instantly, 100K copies of sheet music and over 30K records sold within a day only. 4. White Christmas:This classic Irving Berlin song is old but absolutely popular! According to data revealed in Wikipedia, over 100 million copies of White Christmas sung by Bing Crosby have been sold all over the world. It is by far the best-selling single of all time! 5. Jingle Bell Rock:American people must be very familiar with this melody. Every Christmas, it appears in every corner of United States. This Christmas tune was first issued by Bobby Helms in 1957. 6. Let It Snow! Let It Snow! Let It Snow! :This Christmas music was born in 1945. Like other Christmas songs, it became a hit quickly and has been recorded for a number of times. 7. Christmas Lights:Debuted and peaked at No. 25 on the Billboard Hot 100 and No. 12 on the Billboard Hot Digital Songs chart for the week ending December 18, 2010. 8. It’s The Most Wonderful Time Of The Year: A song with Studio Video released in November 2015. That’s the goddess of love, ladies and gentleman. 9. God Rest Ye Merry Gentlemen:A Christmas song from ‘A Pentatonix Christmas’ which is the fourth studio album by American a cappella group Pentatonix. 10. Oh Santa! :It is a song by American singer and songwriter Mariah Carey from her second Christmas album/thirteenth studio album. 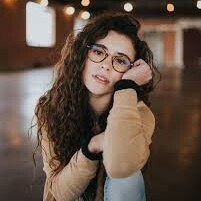 It is an up-tempo R&B song about Carey making a plea for Santa Claus to bring back her partner in time for the Christmas holidays. Christmas song is one of the main features of the Christmas season and its celebration. It is also an important composition during the Christmas as an important feast within the church year. Just choose your favorite Christmas songs as your iPhone ringtones. 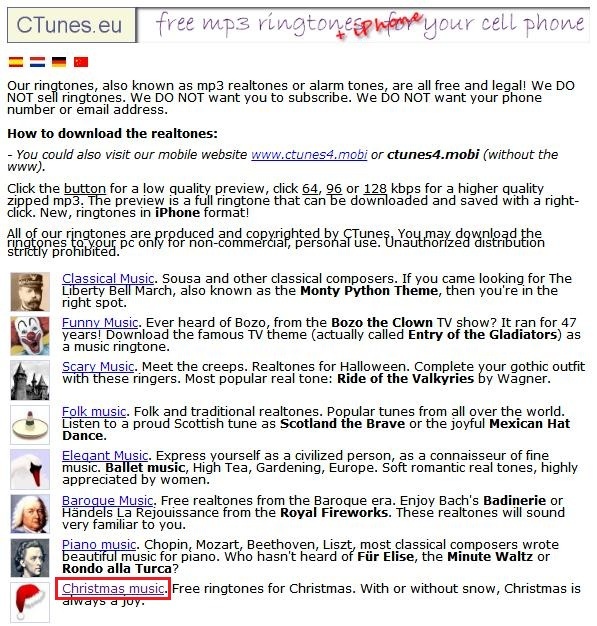 After choosing your favorite Christmas songs as ringtones, how can you download free Christmas ringtones for iPhone? 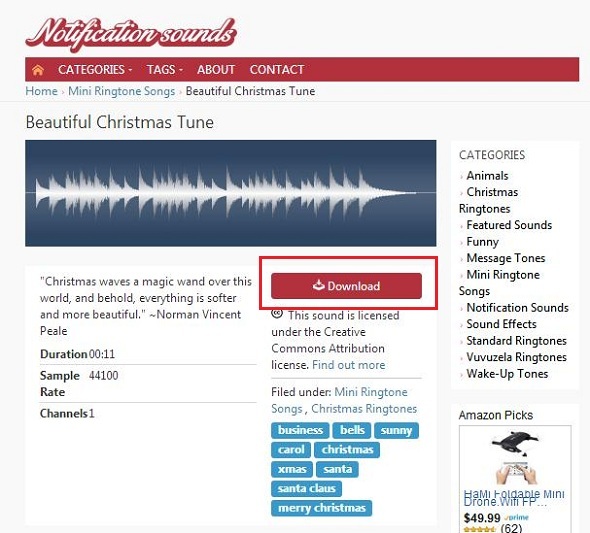 Some sites have a wide selection of Christmas ringtones and allow you to download them on iPhone, while some of them are free but some are not free. Now, we will introduce you 5 sites to freely download Christmas ringtones for your iPhone 6 or 7, 8, X. 1. https://www.zedge.net/ringtones/: It is a famous site which offers free ringtones. Searching for Christmas and you’ll see category, tags, file size, and downloads of every Christmas ringtone. Before downloading, you can hit the play button to preview it. Then click “Get ringtone” to download it to your computer or other storage devices. 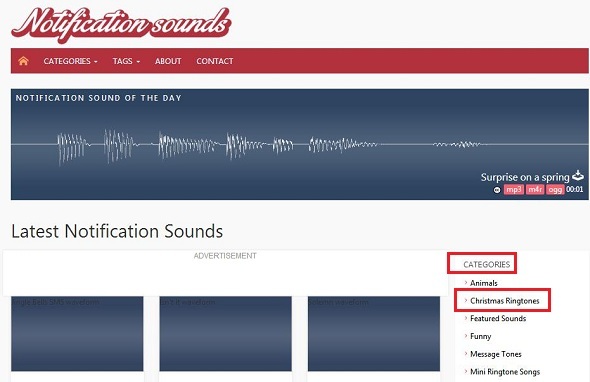 2. https://notificationsounds.com: This site is specially designed to deliver free ringtones, alerts and other sounds for mobile phones. 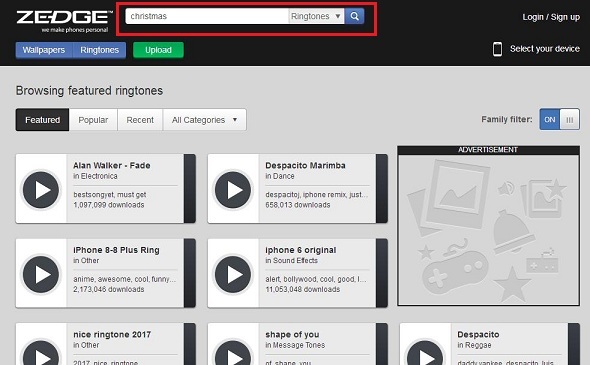 Navigate to “Categories”, and then you’ll see “Christmas Ringtones”. Many popular Christmas songs ringtones are included. Click the ringtone you need and hit the “Download” button on the page. 3. http://tones.mob.org/: This site groups all ringtones by genre and tags. You can go to “Ringtones genres>Holiday” and choose your favorite ringtones. And you can also search for the ringtones you need in the search box. Move mouse over target ringtone, then a green download button shows up. Just hit it, and then the Xmas tone will be downloaded immediately. 4. http://www.ctunes.eu/: This site provides free and legal ringtones for ringtone lovers to download. Just go to “Christmas music” at the main page. You can also preview it by clicking the play button. Then, choose a proper bitrate to download by hitting it. 5. http://www.freeholidayringtones.com/: The home page is the Christmas ringtones page, you can give a left click to the red button to listen (M4R files require iTunes to play), and give a right click and choose “save target as” to download.